BEIJING, Sept. 2,Chinese President Xi Jinping on Sunday met with Sudanese President Omar al-Bashir ahead of the 2018 Beijing Summit of the Forum on China-Africa Cooperation. Xi highly appreciated Al-Bashir's deep friendship with China and his important contributions to advancing China-Sudan relations. 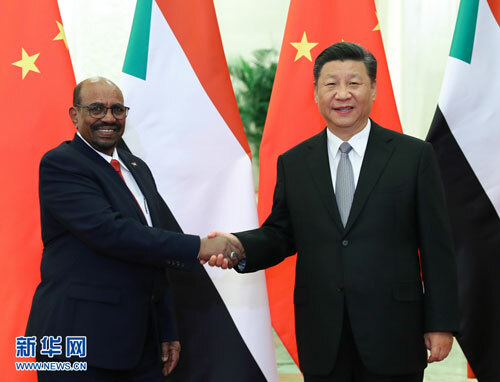 Calling Sudan an influential country in Africa and the Arab world, Xi said China firmly supports Sudan's efforts to safeguard sovereignty, security and stability and opposes foreign interference in Sudan's internal affairs. China welcomes Sudan's participation in the Belt and Road construction and would like to take the opportunity to boost energy cooperation between the two countries and create a new mode of agricultural cooperation covering the entire industrial chain, Xi said. China commends Al-Bashir's active engagement in pushing the signing of a comprehensive peace deal by all parties in South Sudan and is willing to work with Sudan to make an active contribution to peace and stability in South Sudan, the Chinese president added. Hailing the solid mutual political trust and deep traditional friendship between the two countries, Al-Bashir spoke highly of China's great achievements in development and its important role on the international stage. 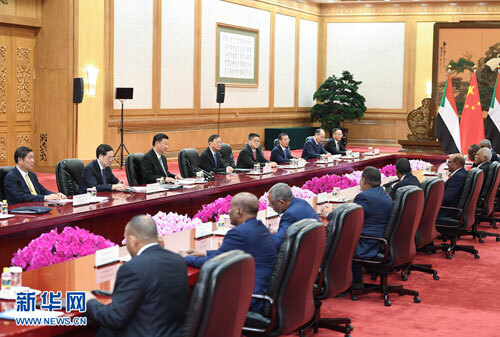 Al-Bashir expressed his gratitude for China's firm support for Sudan's efforts to safeguard sovereignty, independence, and stability, as well as for Africa's course of peace and development.